On 16th May, 2010 the heaven smiled at us. 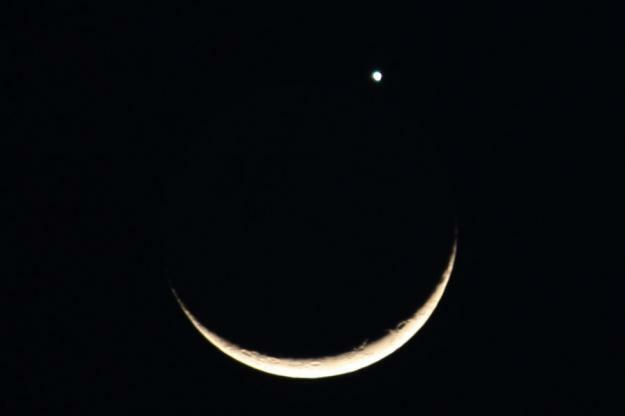 The Venus, Jupiter and the moon aligned together to form a smiley face. The image that circulated on the web was this. But It is said that it was most likely a hoax. Still, I think it is not impossible that the event actually happened. Another picture that looked pretty real had one eye missing probably because the small size and lower brightness of the planet (seen above). But at least it was better than the confirmed recorded image of a 2008 event and it looked as sad as this. It is widely known, that probably the darkest things are the black-holes – which don’t even let the light escape. On the other hand, the brightest things are Quasars. They are so bright that they make it hard for us to see other things around them. But, did you know? The brightest things – Blazars and Quasars are caused by black-holes, which are the darkest things in our cosmos. The fact that brightest things are formed out of darkest things has some sort of a yin-yang profoundness to it! Things can get huge in space. Well, the number 1 void was pretty huge. But it was empty. What if, there was a huge ball of matter burning in space. Something much larger than our sun. Think of this red giant called, Betelgeuse. It is one of the brightest starts in the sky found in the Orion constellation. It has shrunk a lot. But when its size was at the peak it was huge. So huge that if the sun were replaced with it, the end of it would reach Jupiter’s orbit! Obviously, in that case, there would have been no life here. Still that isn’t even the largest known star. The diameter of Betelgeuse is about half of a star known as UY Scuti. This one is so huge that no monitor can show to scale, both, it and the sun in a single image. Here is a comparison of how the sun would look around it. It isn’t visible in the first image, but a small pixel appears when it is zoomed by 7x. Several years from now, the moon used to show the earth all its faces as it moved and spun around. But gradually, due to a thing called tidal locking, the moon started showing a single face of it to us. From earth, you can no longer see the moon spinning and the side of it which faces us, always faces us now. We never see the far side of the moon.